Another BBC production from late 2011, “Jane Austen: The Unseen Portrait?,” reached our dental work via La Niña; one much less hyped than the Many Lovers program we blogged about yesterday, but that we found infinitely more interesting, against our better judgment and preconceived ideas. A while back we complained about the upcoming program as being yet another ill-informed attempt to cash in on Jane Austen. Gentle Readers, Dorothy has served us a heaping helping of fricasseed crow, because we found the program fascinating. We were wrong! Yes, we were! We know what you are thinking: So Editrix, are you convinced that the portrait really is a portrait of Jane Austen, taken from life? We are happy to give the idea a ringing endorsement of: Maybe…just maybe. The portrait, a pencil drawing on vellum in a style known as plumbago (no, really; we looked it up), was dated by several different art historians and a forensic scientist as probably being from the first two decades of the 19th century. The portrait was known to Austen scholars; Deirdre Le Faye wrote about it in the Jane Austen Society Report for 2007. She called it an “imaginary portrait,” done by an amateur artist from his imagination of what Jane Austen might have looked like. The portrait was auctioned in early 2011. The former owner, a manuscript dealer, purchased it in 1982 from the estate of a former M.P. from Cheshire. The portrait could not be traced earlier than that owner. Dr. Paula Byrne, whose husband purchased the portrait for her, is convinced that it could be a portrait of Jane Austen, taken from life. We are sure of that–Paula is quite certain in her conviction. She is not just out for attention; she truly wants to prove that the portrait is of Jane Austen, because she feels it presents Austen as a professional woman writer, not twee spinster Auntie Jane, as so many of the later portraits–fully imaginary themselves–do. Thus this BBC program, presented by Martha Kearney, sets out the portrait as a mystery to be solved: is it a portrait of Jane Austen? Was it taken during her lifetime? Who painted it? And why did Austen’s family seem to have not known about it? As we said, Paula is convinced that her portrait is authentic; she just has to prove it. And she has quite a mountain to climb to convince the Austenocracy: not just snarky bloggers, but some of the most renowned of Austen scholars. 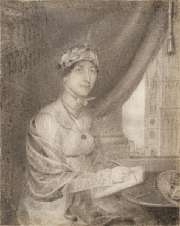 Claire Tomalin’s comments early in the program make a lot of sense to us: why would Austen’s relatives not have produced this portrait when one was wanted for the Memoir? Deirdre Le Faye–a well-known party pooper for this sort of thing, though usually with good reason–still is convinced that it is an imaginary portrait, and not a particularly good one (she is fond of one that she owns, a very pretty portrait of faux Jane indeed). The art historians are confused by the portrait, because the plumbago technique had gone out of fashion a hundred years before the portrait was probably drawn. They think it was done by an amateur artist, though one who has had some training. However, they are not encouraging about Paula’s quest. Sir Roy Strong puts it quite plainly, when asked Paula’s chances of authenticating the portrait: “Nil. N-I-L. Nil.” Another puzzling tidbit is the inscription on the back: “Miss Jane Austin.” Austen with an I! Who of Austen’s family or friends, Deirdre Le Faye reasonably asks, would have spelled it that way? Undaunted, Paula and Martha take the portrait to Chawton Cottage, where the managers exclaim over the portrait’s resemblance to the Austen men, who do have portraits with excellent provenance. We thought it was a really clever idea to use modern forensic face-matching technology to show all the noses–the lady in the portrait, side-by-side with various Austen brothers–and they are remarkably identical. Remarkably so. The building in the background of the portrait is identified quite positively as St. Margaret’s church in Westminster (we’ve been there! and the fact that the Big Ben clock tower is not included in the portrait, in our opinion, tends to narrow down the date to the earlier part of the 19th century). Why would that church, which has no known part in Jane’s life, be in the background of her portrait? Paula opines that Eliza Chute, who married into the Chute family of the Vyne, neighbors of the Austens when they lived at Steventon, was the artist. According to Paula, Eliza’s London home was within the parish of St. Margaret’s, and her house would have had a view of the church similar to that in the background of the portrait. Eliza was also an amateur artist–and she often spelled the Austens’ surname in her diary as Austin. This would also explain why the portrait was unknown to the Austen family–it was passed down among Eliza Chute’s descendants. Armed with her theory, Paula faces a Murderer’s Row of Austen scholars: Deirdre Le Faye, Kathryn Sutherland, and Claudia Johnson (actually, we have met Claudia and she is lovely, not at all scary–but the three of them together must have been daunting!). Paula stands her ground, and when Deirdre Le Faye stubbornly defends her position, is not afraid to get all up in her grille. Deirdre declares that until she is presented with “documentary evidence” that the portrait was taken of Jane Austen from life, she will not accept the portrait as such. Despite our fascination with the accumulated evidence, we fear that will be the final word on the subject: Maybe. As is pointed out early in the program, there is just no real proof that the portrait is of Jane Austen. However fascinating the evidence, it remains speculative. Until or unless there is absolute proof: maybe. Is it even important to have a “real” portrait of Jane Austen? Part of Paula Byrne’s determination to have her portrait authenticated is that she feels it will help dissipate the public sentiment of sweet Aunt Jane. Traveling in Janeite circles, we tend to think that no one really sees her that way anymore, but the trope is certainly out there. Paula’s passion can be forgiven, we think. At pain of being a Deirdre Le Faye-level killjoy, we can see the sense of Le Faye’s argument about the imaginary portrait. Jane’s anonymity was already disappearing by the time of her death. The Prince Regent knew her identity, as did his librarian. It’s not too much to think that others did; others who might even have known Jane in life, or knew Henry, and who shortly after Jane’s death drew her portrait from memory. Does that mean that the portrait should not be considered authentic? Maybe. Can we take the leap of faith? Can we admit, in our heart of hearts, that it just might be real? That the evidence is sufficient? Maybe. Byrne has since walked back the Chute theory — now favoring a nameless “low end professional.” In my opinion, there is a yawning chasm between “might be” and “can’t not be” and Byrne has not come anywhere near building the bridge to the latter. Loved your use of “Phwoar” — a terrific word, and it’s certainly most appropriate in this instance! That’s kind of a shame that Paula has “walked back” on her initial conclusions. I actually rather like the Eliza Chute theory, though I think it rather more likely it was done from memory and not life. I think the Austen family would have known about it if Jane had sat for it. But the connection to the Austens would explain why the painting was framed and Jane’s name put on it, but the Austens never knew about it. But really it could be any amateur artist. I’m with the expert in the show who said the proportions were not great and that an artist with training–a professional–would have done a better job. And Jane in my head still looks like Anna Chancellor! It may all be idle speculation but I can envision this “likeness” of Miss Austen a lot easier than any of the others. She looks elegant, classy, busy, intelligent. Phony or not, I LIKE it. That’s great, Jeffrey. I like a lot of the disputed portraits, too–particularly the little James Stanier Clarke “Friendship Book” sketch. I don’t have any problem accepting them as “maybe” Jane Austen portraits. They can’t be proved to acceptable academic standards, but we can still enjoy them. I read an interview by an art expert soon after this programme was aired. The bit about forensic face matching can’t be accepted as evidence when used on a painting. An artist painting the same nose two or three times will make variations. Paint can smudge or drip. The fact that all the brothers were painted by different artists makes even more unlikely that forensic analysis will pick up exact comparisons.It can only really be done with photographs or film and even then with the advent of photoshop??? To put it bluntly forensic evidence on paintings can only really tell you if there is another painting underneath and the chemical constituents of the paint.. Personally, I think this drawing looks like Miss Gulch in The Wizard of Oz. Has anyone considered that the clothing / head gear in the portrait is more mid-Victorian than Regency? Can anyone think of any rational reason why Jane Austen would go to the trouble of posing for and (if it was indeed a low end professional) paying for a portrait and then not take it home with her or have it delivered? And why would she not mention it to any of her family? It makes absolutely no sense to me. And why the cat? Jane Austen didn’t have a cat, – James Edward Austen-Leigh could hardly have failed to mention it if she had, it would have fitted so well with the Dear Aunt Jane image – so why would she want one in her portrait? Agreed. I don’t think it was taken from life. 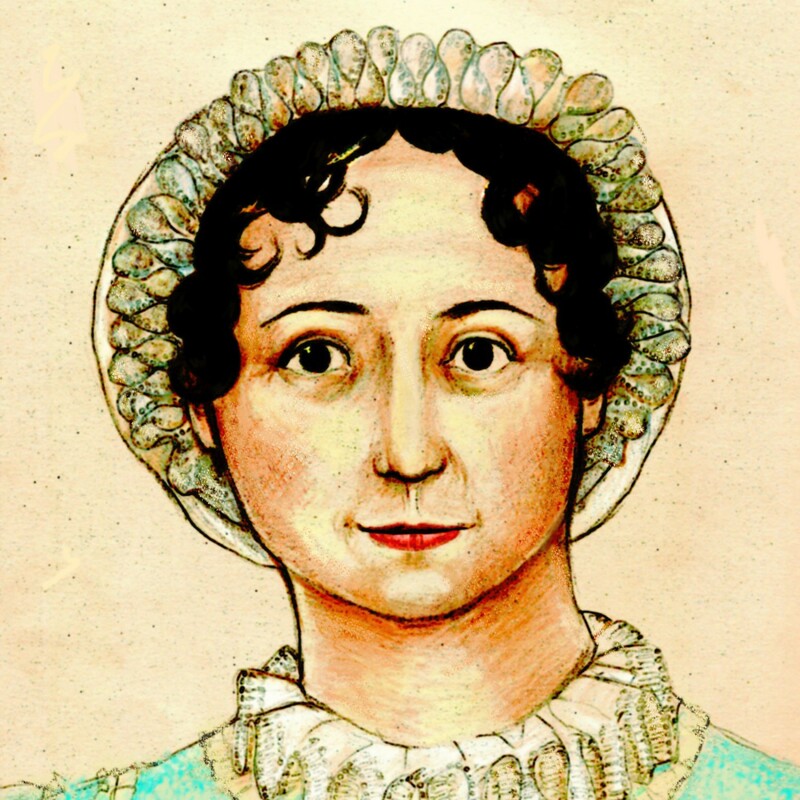 However, I’m willing to believe that the (amateur) artist might have met Jane at some point later in her life, or even knew one of her brothers and drew a woman who could have been the sister of one of the Austen men. Didn’t they have a pet dog at Chawton Cottage? I think Cassandra definitely did later in her life, and I seem to recall Jane mentioning a dog in one of her letters. But I think it was more or less Cassandra’s pet. I don’t know whether Jane or Cassandra had pets (I don’t remember any references, but that doesn’t mean anything) — but this immediately made me think of the photo of Martha Lloyd Austen in later life, with a big dog on her lap. Odd, isn’t it, that that there is so much mystery around Jane Austen’s appearance, but Martha’s is fixed forever in a photograph — less room for imagination there. The dog is mentioned in several biographies and in Maggie Lane’s Jane Austen and Food. He was called Link, and would accompany the servant to obtain groceries and carry the milk-pail home in his mouth – so he must have been a fair-sized dog. But he is always spoken of as Cassandra’s dog, as you say, and I don’t think he appears in the Letters. An anonymous little black kitten does, but it belonged to the landlady of rooms in Bath rented by Edward Austen/Knight, with whom Jane and her mother were staying, so the cat in the portrait remains a mystery even supposing it to have been drawn from memory or the imagination. Love how in the doc they mention that cats were a symbol of spinsterhood. Glad that we no longer have such awful stereotypes. Oh, I have to run. I have 6 cats to take care of. This sure would be a lot easier if I was married and had some help.